Great map and it's "pay what you want"! This Map-pack not only is pay-what you want, it comes in a zip-file that sports two folders: One containing high-res jpegs, one that sports pdfs. The pdfs clock in at 23 pages each – 1 page front cover, 1 page editorial, 1 page advertisement, leaving a total of 20 pages for the maps. The pdf first provides aforementioned maps that also are included as high-res jpegs – so if you require an overview of the village, these would be what you want. Thereafter, we get 4 blown-up versions of the map – each iteration is provided in a version, wherein the map spreads across a total of 4 pages, thus allowing you to print out a big map. If you’re like me a European, you will be very much in luck, for one pdf provides the maps in letterpack format, whereas the second delivers the maps optimized for the A4-format. What about the town – well, we get essentially a village of the most idyllic type, with a single (mage’s) tower a bit off to the south and a small bridge crossing the meandering river. North of said small bridge, a mill and a few buildings loom, while the sparse trees show that this place probably lies in pretty civilized fields. 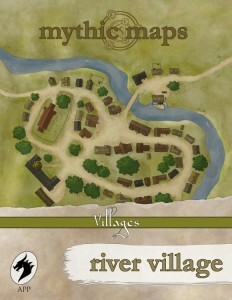 Tad Davis delivers a professionally-made, beautiful map-pack of a nice, picturesque village that could well be the starting point of a new campaign – as far as maps are concerned, this is a neat job and the drawing style is fine. While I caught myself wishing there was a version with a grid further blown up for your perusal with miniatures, at any price you’re willing to pay, this is indeed a great offering of a professional, nice map. My final verdict will clock in at 5 stars + seal of approval. You can get this nice map for any price you want here on OBS!